Giovanni Schneider, CEO of the Schneider Group, has launched a petition via the website Change.org to help reduce the threat of microplastic fibres. 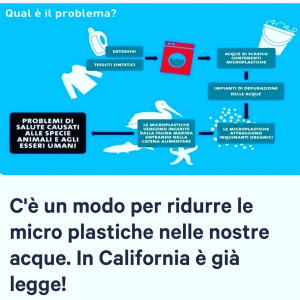 The petition is addressed towards the Italian government to develop a law that helps make consumers aware of their usage of synthetic clothing and reduce the number of synthetic microfibers entering our water systems. Similar laws are already underway in California as well as New York. These laws foresee that clothes made of more than 50% synthetic fibres need to be clearly marked as being harmful to the environment due to the shedding of synthetic microfibres. More and more research studies reveal the harm caused by synthetic clothes shedding microplastic fibres. These tiny plastic particles find their way into our rivers and oceans causing harm to marine life and then subsequently also to our own human health. All garments made of natural and synthetic fibres shed microfibres during wear and washing. The difference is that natural fibres particles biodegrade while synthetic fibres do not. Research shows that synthetic microfibres accumulate in water and bind other toxic chemicals. Plankton and fish often absorb these microfibres and therefore these toxic particles end up in our food chain causing toxic harm. The rise of fast fashion using cheaply produced synthetic fibres and being washed frequently is unsustainable and a threat to our health and our planet. Encouraging the production and use of clothes made of natural fibres such as cotton, silk and wool can contribute to a healthier future and will also add a positive economic impulse for the Italian textile industry. We kindly invite you to sign the petition initiated by Giovanni Schneider to help move consumption into a sustainable direction. Click here. The Australian Market seemed to find a level this week with a range of types and microns varying slightly each way. As with recent weeks we saw no significant change, with the AWEX EMI closing 7c higher than last week. The highlight of the week was the annual sale held at the Sydney Royal Easter show across Tuesday and Wednesday. This event see’s close to 1 million people making the trip to Homebush over the two weeks, bringing new interest into the wool sales and attracting a lot of attention to the industry. A larger offering including a few slightly better style types meant better specification fine wools remained keenly sought after with an evident premium for NM clips still there. The bulk of the offering was similar to recent weeks with low yields. Lower style wools somewhat ‘caught up’ as buyers looked to gain some quantity before the Easter break period. Crossbreds again continued to rise this week particularly in the Northern Region. With a one week break from sales now coming up there will be a similar sized sale to this week when we return in Sale 44. Due to seasonal conditions the quality of clips is also expected to be lower than usual as well as continued low yields. However as usual there should remain a number of nice wool’s coming through. With the current Foot and Mouth Disease situation in South Africa not forecast to be resolved in the immediate future it is expected competition for Chinese spec clips to remain steadily firm. Fleece slightly cheaper by 5-10 cents, skirtings 15 cents dearer, open tops 25 cents dearer. Fleece prices eased by a further 5-10 cents today. Better style fleece remained firm. PJ Morris, Seatech and Tianyu were the main buyers today. Fleece had a high passed-in rate of 26.2% today. Open tops were generally a further 25 cents dearer today. The market continues to hold its ground despite the poor style offering. Best style/strength well supported par to 1% dearer. Good/Ave style fleece irregular based on specification. Best style unchanged in limited. Open top cheaper 1% today in poor style offering.